As we explained previously, the next update to the game will take us a few weeks to get done. In the meantime we invite you to take a look at what we’re working on and how progress is going. 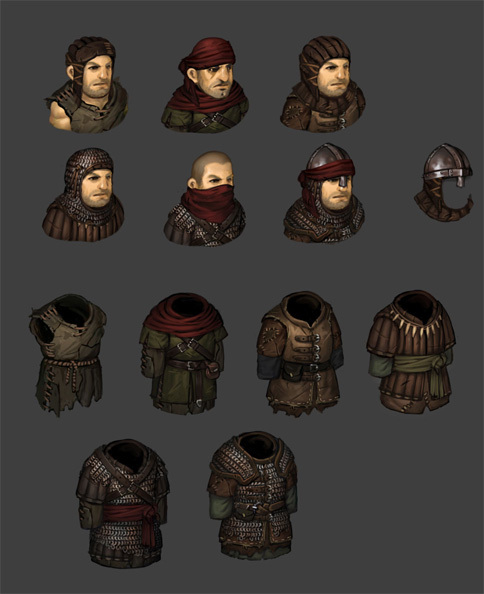 This week we’ve added a wide variety of worn armor and helmets for the bandit faction and started work on the Goblins. So far, everyone was wearing well-crafted armor and helmets in mint condition. This always felt a bit out of place especially with the bandits who looked pretty much like regular soldiers or militia forces with their equipment. After all, they are supposed to be outlaws living in the woods and they can have a hard time getting materials to repair their gear. To address this, we’ve made a variety of new armor and helmets with a worn-out look, gear that has been patched up many times, lost some parts or has become rusted. This gives the bandit faction a unique look and makes them stand out from other human factions. What is more, all these items have their own values for armor and fatigue penalties. In general, the worn-out and patched armors are a bit lighter, giving less fatigue penalties but also having less armor points. Although bandits make the most use out of this new equipment, it isn’t exclusive to them. These items are not sold in shops, but they can of course be looted and used by the player, and some backgrounds the player can hire now also wear ragged surcoats, headscarfs and many more of those new items as starting equipment for a more flavorful look. 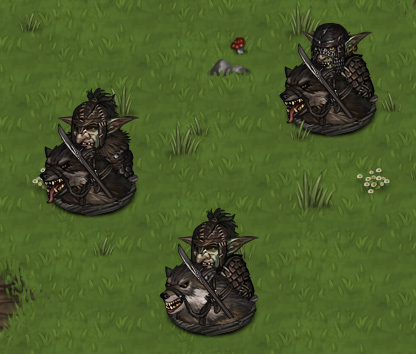 Goblins are of course the major coming new feature for Battle Brothers. We’ll do a proper reveal in time and talk about their place in the world, their culture, their equipment and their individual troop types in detail. Until then, we didn’t want to leave you without a small teaser of what is to come. So here it is, an image of the Goblin Wolfrider! Most of the assets for the Goblins are done, and now we’re on to implementing them into the game. Since they come with a bunch of unique skills and an extensive armory of their own, that’s quite a bit of work. Once that’s done, we’ll have to extend the AI to allow it to actually make use of all the new weapons, skills and tactical options. Finally, we have to playtest and balance the new faction to make sure they work as intended and that combat against them is both challenging and fun. And wolf riders, they look awesome! I can’t wait to fight then! I admit that the new armors look a lot better. Now that I am working fulltime I can produce much higher quality stuff. Maybe the “old” armors and Brother Faces wil get a little touch up when I’ve got the time. Don’t belittle your work, Psen. I find standard gear looking as good – if not better – as the bandit gear. It’s just that the bandit gear is new to the game and it does give a whole new look to the bandits. It really gives them a more unique feeling. Personally I am waiting for a tabards with customizable coats of arms. To give my mercenary company more professional look. I would not want to pressure you. In addition, you are now able to fully deserved euphoria :). But it would be very nice if the next update, which is just one of the goblins will require new games- issue was resolved according to the scheme of distribution of skills at level up. I think the situation now there is not satisfied even yourself. Yeah, ich wusste, ihr denkt auch an Reittiere. Ich hoffe, wir werden in Zukunft mehr von ihnen sehen. Vielleicht auch Reittiere für die Weltkarte. Top! It is a good game,I have shared with my friends this game,we all like the game,expecting your next update,come on! Great work! I love you guys!